6 WEEKS AWAY FROM THE BIG SHOW! The “news cycle” for the global satellite-enabled marketplace over the next few days will be dominated by the successful launch of SpaceX’s Falcon 9 with ten Iridium NEXT satellites, culminating in the dramatic upright landing of the Falcon 9 first stage and then the picture-perfect deployment of the spacecraft. Iridium’s expanded capabilities will affect all of its customers, including military and government users who depend on 24/7/365 communications access. 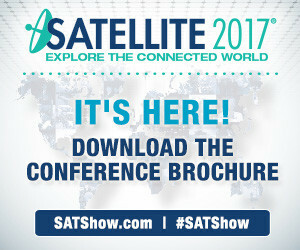 Here at SATELLITE 2017, we’re supporting the continued development of the marketplace for this critically important client base with a comprehensive sequence of expert sessions designed for executives serving the market and users seeking to understand up-to-the-minute and planned capabilities. Create your free account and to streamline your SATELLITE experience today! If you’re planning to exhibit at SATELLITE 2017 and want your company information featured in the printed Program Guide distributed on-site to more than 14, 000 satellite and space professionals, we need to hear from you now! The deadline for inclusion in the Program Guide is Friday, January 27, and exhibit space options in prime locations on the show floor are decreasing daily. Start the year off right by positioning your company at the world’s largest gathering of high-level attendees involved in access to space, imagery/sensing, connectivity, hardware and finance. Contact Michael Cassinelli today at mcassinelli@accessintel.com or +1 (301) 354-1691 to discuss the best available location for your company. Ready to reserve your space? Download and submit your exhibit space contract for the booth of your choice while it’s still available! Stay connected - join the SATELLITE social media communities! Connect with thousands of communications professionals via LinkedIn, Twitter, Facebook and Instagram. Have you checked out our YouTube channel? Coupled with videos and interviews from Via Satellite, you'll find plenty to entertain yourself for hours! Or, for just a few minutes while you let your mind take a break from the daily grind. MELBOURNE, Fla. – Jan. 12, 2017 – The U.S. Navy’s AN/AES-1 Airborne Laser Mine Detection System, designed and manufactured by Northrop Grumman Corporation (NYSE: NOC), has achieved Initial Operational Capability. ALMDS provides rapid wide-area reconnaissance and assessment of mine threats in sea lanes, littoral zones, confined straits, choke points and amphibious areas of operations. “With Initial Operational Capability, the ALMDS program has delivered a new and important capability to the Navy and to our nation—the first of its kind for mine warfare, ” said Erik Maskelony, assistant program manager, Airborne Laser Mine Detection System, PEO LCS, Mine Warfare Program Office (PMS 495). [Via Satellite 01-17-2017] With the aim to transform the domestic In-Flight Connectivity (IFC) market in China, Gilat Satellite Networks has announced a strategic partnership with Air Esurfing, a fully owned subsidiary of Air Media Group.